Elevation's trail running collection is curated and carefully crafted. Nothing is filler. Instead, each run is a destination and an experience to be enjoyed in the Alps. Here's the scoop... we did many more runs than what you'll find in both the Run the Alps Switzerland guidebook, and for this website. Many didn't make the cut, they only made our legs more tired than they already were. We'll save you the effort so you can stick to what runs we think are exceptional. Our foundation for defining all the Runs at Elevation is based on our Run the Alps Switzerland book. The guidebook describes each run, offers detailed information to find the trail head, do the run, and understand what is involved. Elevation provides an online resource, and of course the GPX track to follow the exact route we suggest. Why did you choose these runs? This is a question Kim and I kept asking Janine, who determined and created all the book runs. "Really? We have to go all the way to the back of the valley for a 20km run?" This was a point Janine defended, "Yes, let's go have a look". More than having a list of trail runs to tick, Janine wanted to encourage people to explore other parts of Switzerland, to go to areas they might not have reason or motivation to visit. When we started the book project, all the time spent going to the runs seemed a little out of proportion with the time we actually spent running. But in the end we all had a sense we'd done something special. We had seen a lot of parts of Switzerland that for me, even after 17 years, were new. And, we all had some new favorite places. Guides often comment about how most clients want to do the same trips as everyone else. The icons. Skiers have the Haute Route and hikers the Tour of Mont Blanc. But are they the best tours, or the just the best tours to say you've done? I would argue that there are many gems scattered around the Alps that are far, far better, and much less crowded. Some of the runs you'll find here will be out of the way, and you too may ask, "Really? We have to go all the way to the back of the valley for a 20km run?" Yes. Like Janine said, "Go have a look". 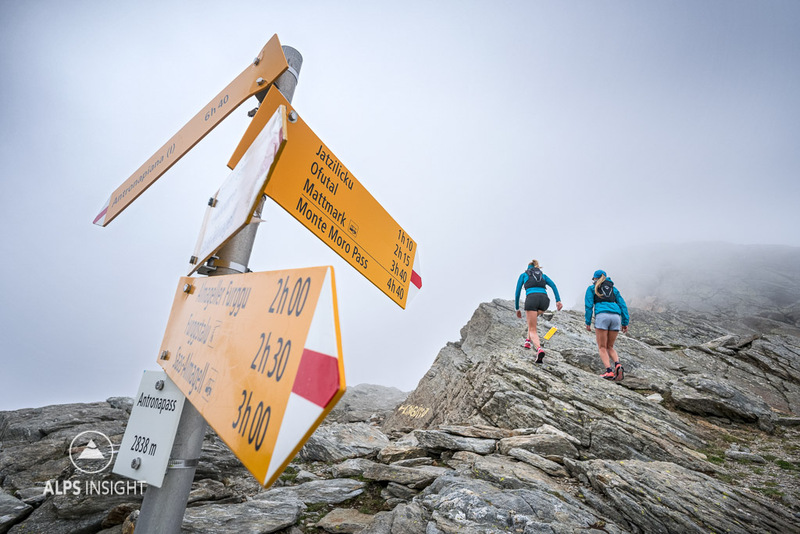 If you don't believe us, start with the Zinal Run! All the Runs are visible on one map. If you are unfamiliar with Switzerland but know where you'll be visiting, you can see what's nearby. Visit the Runs Map. The Elevation runs are searchable by canton. If you're unfamiliar with Switzerland, a canton is like a state. There are 26. We've only included the higher mountain regions of Switzerland. For more information about the Swiss mountain regions, visit our Swiss Alps mountain region page at ALPSinsight. Each run will include a strip of icons detailing distance (→), vertical gain (↑), high point (Δ), difficulty (♦), and if the route is a point to point, out & back or loop (Θ). Also for a loop, which direction we recommend. Way Up runs are designated (⇑). We consider a variety of factors to assign a difficulty level to a run: distance, vertical gain, technicality, remoteness, exposure, and support available en route. The ratings come down to our opinions - these things are relative. Dan's Easy run might be your WTF was that?! That's why the rest of us get some say in the rating as well. Easy: These runs stick to yellow signposted routes or red & white painted markers that are easy to follow. They are typically shorter and with less vertical gain than other runs. Footing is generally smoother, but still on mountain trail. There are typically huts, fountains, and infrastructure along the way. Medium: They follow yellow signposted routes, red & white, and blue & white painted markers, or sometimes need to be navigated by cairns. They usually have long sections of smooth running, but can have some technical footing, and occasionally pass into easier alpine areas that may be exposed with danger of falling, loose scree, cables and ladders, or light scrambling. Difficult: These trails may also include sections of blue & white marked routes or need to be navigated by cairns. Sure-footedness is necessary here. The trails are more technical and exposed sections present the danger of falling. The route can cross loose scree, steep slopes, or glacier, and may require the use of cables or ladders and scrambling. These runs can be long, have big elevation gain, and take you to wilder, remote areas without an easy way to bail. Sudden change in the weather can make the route difficult. Good judgement and alpine experience are a must. The Way Up is our name for peak running, or, running huge vertical that typically includes a summit. You can read all about it at The Way Up Concept. The ratings we use need some explaining because they differ from our All Runs rating and are only relative to other Way Up Runs. The alpine grade, if applicable. A Way Up Run will be characterized as Difficult within the All Runs category, but will have a separate rating within the Way Ups. As an example, the Barrhorn, which is both a Run and Way Up, would be rated ♦Difficult/⇑Easy. It's a Difficult Run but an Easy Way Up. Beyond Easy/Medium/Difficult, some Way Ups may have an Extreme rating. Extreme: This one is going to be used very sparingly, but it is used (See Eiger West Flank), and needs to make it clear that not all these runs are just running. They might include technical climbing with serious consequences if there is a fall. These climbs may include a trail running approach and/or descent. The Eiger West Flank is ⇑Extreme/AD, it's not categorized as a Run, it is an Extreme Way Up with an alpine grade of AD. The GPX files for non-Book Runs and Way Up routes are available at our Movescount Page, and linked from each run page. Anyone undertaking the runs on this site is solely responsible for their own safety, and should exercise good mountain judgement, undertake thorough route research, be physically and mentally ready for the challenges, properly equipped, and should be ready to turn back if conditions become more demanding than their abilities can handle.